Choose from liquid or aerosol cleaners depending on your cleaning preference. We carry aerosol deodorant in combination with disinfectants, so you can make rooms smell fresher while still sanitizing them. Our liquid chemicals come with citrus scents, too, making it easy to freshen up a dining hall, hallway, or an individual room. We also carry bleach for sanitizing bathrooms, floors, and soiled clothing and linens! Also make sure to check out other great items from Noble Chemical, 3M, Pure Bright, Purell, Scrubbing Bubbles and Windex. If you need a hospital disinfectant to sanitize surfaces and floors in your healthcare facility, we have the cleansers you need! Not only will these disinfectants create a more sanitary environment, but they'll also freshen it up by removing odors in kitchens, bathrooms, and more! Use aerosol deodorant to add even more refreshing fragrance to your business. For other cleaning essentials, be sure to check out our restroom cleaning chemicals, surface disinfecting chemicals, and hard floor cleaning chemicals. 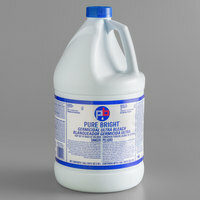 If you're wondering where to buy pure bright disinfectants, we have a large selection of pure bright disinfectants for sale at the lowest prices.